Die Veneris, videlicet, 13 die Maii. Doctor Hackett recommended to be a Canon Residentiary of St. Pauls. The Message Yesterday from the H. C.
For Committees to prepare an Answer to the King. And Letters to the Committees at York and Hull. They have agreed to the Votes of this House. Trained Bands to be mustered. Examinations about bringing up the Army. Committee to consider of Captain's Commissions. Sir George Strode's Counsel assigned him. Mr. Spencer's Counsel assigned him. Bushel versus Sir Richard Price. Further Report of the Message Yesterday from the H. C.
For Committees to meet to prepare an Answer to the King, and Letters to the Committees in Yorkshire. That the H. C. concur in the Declaration of Indemnity to the Committees at York. Vote against any who shall molest the said Committees. Vote to indemnify Persons acting under the Ordinance for the Militia. For appointing a Day for the Militia of the several Counties to be reviewed. For Committees to meet about the Examinations about bringing up the Army. And the Captains of Foot Commissions, with Amendments. Committee to consider of the Amendments. Huet Leat's Cause, concerning the Capture of his Ship The Unicorn. Message from the H. C. with the Commission for Captains of Horse. Message from the H. C. with a Letter to be sent from both Houses to the Committees at York. The Report of Mr. Justice Heath, concerning Mr. Walter, was read. Recommended to the Lord Keeper, according to the Certificate, which this House confirms. The Petition of Tho. Warren, Clerk, was read. Ordered, To be recommended to the Ordinary, to do therein according to Law. "1. That the Committees of both Houses may meet, to prepare an Answer to the King's Messages." "2. To prepare Two Letters to the Committees at Yorke and Hull." Agreed to the Votes; and Ordered, To be printed and published. "4. That the Trained Bands may be drawn out and mustered, according to the Militia, some certain Day." Midd. will be ready to train some Day the next Week. The rest of the Lords Lieutenants are to inform themselves of the Time they will be ready, and then to acquaint this House with the same. "5. The Amendments in the Form for the making of Captains of Foot were read." "6. That the Committees (fn. 3) do peruse the Depositions and Examinations concerning the bringing up of the Army." Ordered, That the Committee (fn. 3) do meet this Afternoon. L. Viscount. Say. L. Wharton. To let them know, that their Lordships have agreed to all the Particulars of the Message Yesterday, only the Amendments in the Form for making of Captains, for which the Lords have appointed a Committee to meet this Afternoon, at Two a Clock, with a proportionable Number of the House of Commons. Ordered, upon the Petition of Sir George Strode, That Mr. Hackwell, Mr. Hearne, Mr. Hales, Mr. Chute, and Mr. Hoskins, shall be assigned Counsel with him, in the Impeachment brought up from the House of Commons. Ordered, upon the Petition of Ric. Spencer, Esquire, That Mr. Hakewell, Mr. Herne, Mr. Hales, Mr. Chute, and Mr. Hoskins, shall be assigned to be of Counsel with him. Ordered, That Wm. Marsh, being brought up on a Habeas Corpus this Day to this House, shall be released of his present Restraint. Mr. Bushell complains, "That Mr. Bushell, being His Majesty's Farmer of the Mines in Wales, hath been disturbed in the Works, and the Ditches thrown down, and the Sheds spoiled, and all destroyed out of Envy. "Twenty Pounds in Silver out of a Ton of Lead in one Mine, and Six Pounds in Silver out of a Ton of Lead in another (fn. 4) Mine. "That the Defendants, in Contempt of their Lordships Order of the 14th of August, have destroyed the said Works." Jo. Edwards, upon Oath, said, "That he served the Order, dated the 14th August, upon Sir Ric. Price, the 17th of October, on a Sunday, at his House, at Gougurgon, in Wales." Joseph Exeter said, "That, after the Order was served, the Workmen were threatened, and forbid working there, and discharged, and the Rubbish thrown into the Works, by Mr. Vaughan, on Michaelmas-day (fn. 5) last. "That Sir Ric. Price's Servant did command Exter and the Workmen to give over working, in the King's Name." Walter Basby, sworn, said, "That Sir Ric. Price (fn. 6) was at first, Four or Five Years ago, Partner with Mr. Bushelle; then he gave over the Work, as a Thing desperate. "And Five or Six Weeks ago Sir Ric. Price did forbid the Workmen to cut Turf upon the King's Common, and denied Water to drive their Engine; and now the Water hath drowned their Works, for Want of the going of that Engine. "That Sir Ric. Price keeps Courts every Fortnight, oftener than he needs, to draw away the Miners." Barthol. Clocker, sworn, said, "That Sir Ric. Price, about Four or Five Weeks ago, did forbid the Workmen to work upon his Ground." Ric. Dikins, sworn, said, "That Vaughan, Sir Ric. Price's Man, did take away his Tools, and bid him forbear to work, in the King's Name; and was beaten for holding the Horse of the Messengers." John Williams said, "That he had his Horse and Sword taken from (fn. 7) him, and beaten by Newell's Man, and others, Tenants to Sir Ric. Price, going down with the Messenger of this House." Mr. Vaughan said, "That these Mines were never wrought by the King's Title; but a Lease made by Sir Ric. Price's Ancestors to one Mr. Newell." Mr. Solicitor said, "That, if it be a Mine Royal, the King by Law is to have Water and all other Conveniencies that are (fn. 8) "
Upon hearing of Counsel of both Sides, and mature Deliberation hereof; the House Ordered, That the Possession shall be settled according to the former Order, until it be evicted by Law; and that no Disturbance nor Interruption shall be in the mean Time, of Mr. Bushell nor his Works; and that a speedy Trial shall be, for the Trial of the Title. "1. That the House of Commons desires that the Lords Committees formerly appointed may meet with the Committee of the House of Commons, to prepare a speedy Answer to (fn. 7) the Message received Yesterday, and to perfect the Answer to His Majesty's last Messages; and to prepare a Letter of Thanks to the Committees at Yorke; and to let them know therein that the Houses of Parliament will make their Care their own, and maintain them in what they shall do in Obedience of their Commands; and that a Letter to the same Purpose be sent to the Committees at Hull, and the Votes inclosed." Ordered, That this House agrees with the House of Commons in this Particular. "2. 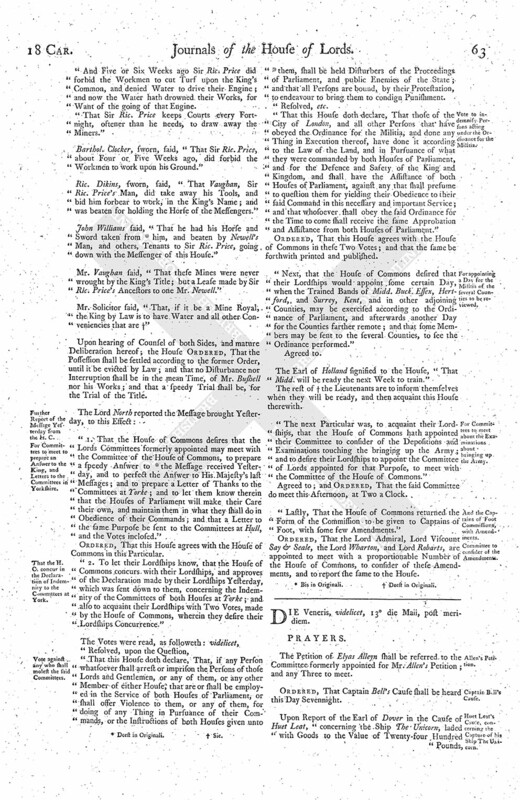 To let their Lordships know, that the House of Commons concurs with their Lordships, and approves of the Declaration made by their Lordships Yesterday, which was sent down to them, concerning the Indemnity of the Committees of both Houses at Yorke; and also to acquaint their Lordships with Two Votes, made by the House of Commons, wherein they desire their Lordships Concurrence." "That this House doth declare, That, if any Person whatsoever shall arrest or imprison the Persons of those Lords and Gentlemen, or any of them, or any other Member of either House, that are or shall be employed in the Service of both Houses of Parliament, or shall offer Violence to them, or any of them, for doing of any Thing in Pursuance of their Commands, or the Instructions of both Houses given unto (fn. 9) them, shall be held Distrubers of the Proceedings of Parliament, and public Enemies of the State; and that all Persons are bound, by their Protestation, to endeavour to bring them to condign Punishment. 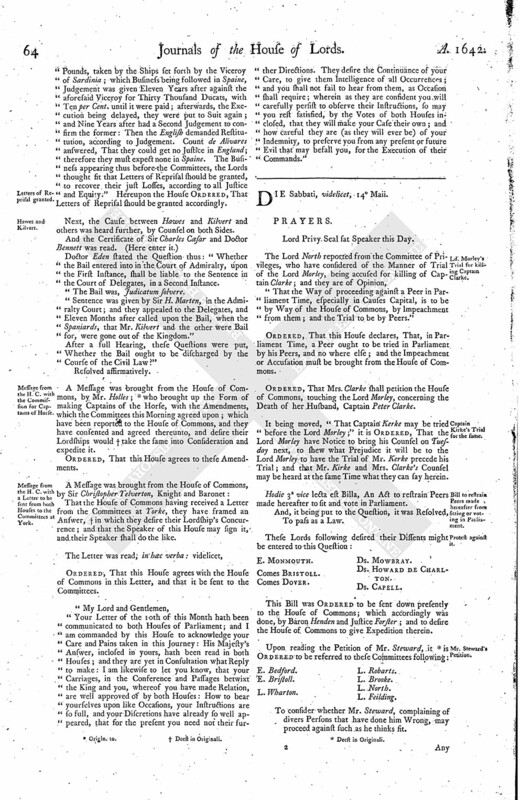 "That this House doth declare, That those of the City of London, and all other Persons that have obeyed the Ordinance for the Militia, and done any Thing in Execution thereof, have done it according to the Law of the Land, and in Pursuance of what they were commanded by both Houses of Parliament, and for the Defence and Safety of the King and Kingdom, and shall have the Assistance of both Houses of Parliament, against any that shall presume to question them for yielding their Obedience to their said Command in this necessary and important Service; and that whosoever shall obey the said Ordinance for the Time to come shall receive the same Approbation and Assistance from both Houses of Parliament." Ordered, That this House agrees with the House of Commons in these Two Votes; and that the same be forthwith printed and published. "Next, that the House of Commons desired that their Lordships would appoint some certain Day, when the Trained Bands of Midd. Buck Essex, Hert ford, and Surrey, Kent, and in other adjoining Counties, may be exercised according to the Ordinance of Parliament, and afterwards another Day for the Counties farther remote; and that some Members may be sent to the several Counties, to see the Ordinance performed." The Earl of Holland signified to the House, "That Midd. will be ready the next Week to train." The rest of (fn. 10) the Lieutenants are to inform themselves when they will be ready, and then acquaint this House therewith. 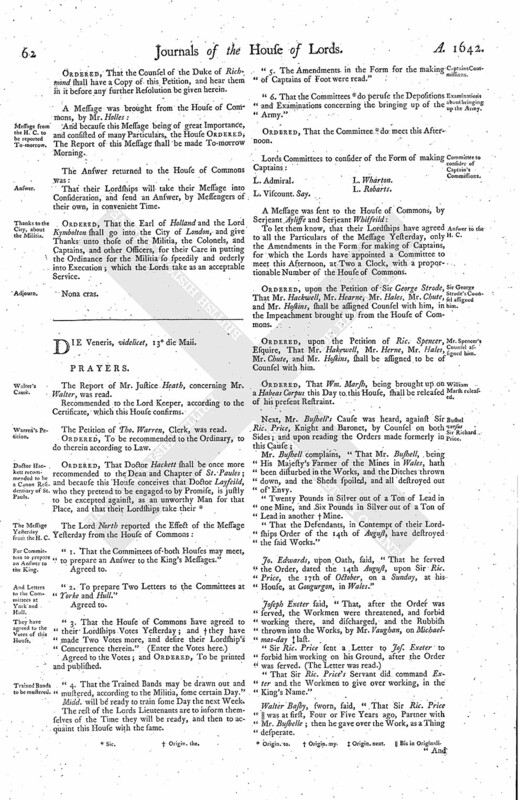 "The next Particular was, to acquaint their Lordships, that the House of Commons hath appointed their Committee to consider of the Depositions and Examinations touching the bringing up the Army; and to desire their Lordships to appoint the Committee of Lords appointed for that Purpose, to meet with the Committee of the House of Commons." Agreed to; and Ordered, That the said Committee do meet this Afternoon, at Two a Clock. "Lastly, That the House of Commons returned the Form of the Commission to be given to Captains of Foot, with some few Amendments." Ordered, That the Lord Admiral, Lord Viscount Say & Seale, the Lord Wharton, and Lord Robarts, are appointed to meet with a proportionable Number of the House of Commons, to consider of these Amendments, and to report the same to the House. The Petition of Elyas Alleyn shall be referred to the Committee formerly appointed for Mr. Allen's Petition; and any Three to meet. Ordered, That Captain Bell's Cause shall be heard this Day Sevennight. Pounds, taken by the Ships set forth by the Viceroy of Sardinia; which Business being followed in Spaine, Judgement was given Eleven Years after against the aforesaid Viceroy for Thirty Thousand Ducats, with Ten per Cent. until it were paid; afterwards, the Execution being delayed, they were put to Suit again; and Nine Years after had a Second Judgement to confirm the former: Then the English demanded Restitutution, according to Judgement. Count de Alivares answered, That they could get no Justice in England; therefore they must expect none in Spaine. The Business appearing thus before the Committees, the Lords thought fit that Letters of Reprisal should be granted, to recover their just Losses, according to all Justice and Equity." Hereupon the House Ordered, That Letters of Reprisal should be granted accordingly. Next, the Cause between Hawes and Kilvert and others was heard further, by Counsel on both Sides. Doctor Eden stated the Question thus: "Whether the Bail entered into in the Court of Admiralty, upon the First Instance, shall be liable to the Sentence in the Court of Delegates, in a Second Instance. The Bail was, Judicatum Solvere. "Sentence was given by Sir H. Marten, in the Admiralty Court; and they appealed to the Delegates, and Eleven Months after called upon the Bail, when the Spaniards, that Mr. Kilvert and the other were Bail for, were gone out of the Kingdom." After a full Hearing, these Questions were put, Whether the Bail ought to be discharged by the Course of the Civil Law?" A Message was brought from the House of Commons, by Mr. Holles; (fn. 11) who brought up the Form of making Captains of the Horse, with the Amendments, which the Committees this Morning agreed upon; which have been reported to the House of Commons, and they have consented and agreed thereunto, and desire their Lordships would (fn. 12) take the same into Consideration and expedite it. Ordered, That this House agrees to these Amendments. That the House of Commons having received a Letter from the Committees at Yorke, they have framed an Answer, (fn. 12) in which they desire their Lordship's Concurrence; and that the Speaker of this House may sign it, and their Speaker shall do the like. Ordered, That this House agrees with the House of Commons in this Letter, and that it be sent to the Committees. "Your Letter of the 10th of this Month hath been communicated to both House of Parliament; and I am commanded by this House to acknowledge your Care and Pains taken in this Journey: His Majesty's Answer, inclosed in yours, hath been read in both Houses; and they are yet in Consultation what Reply to make: I am likewise to let you know, that your Carriages, in the Conference and Passages betwixt the King and you, whereof you have made Relation, are well approved of by both Houses: How to bear yourselves upon like Occasions, your Instructions are so full, and your Discretions have already so well appeared, that for the present you need not their further Directions. They desire the Continuance of your Care, to give them Intelligence of all Occurrences; and you shall not fail to hear from them, as Occasion shall require; wherein as they are confident you will carefully persist to observe their Instructions, so may you rest satisfied, by the Votes of both Houses inclosed, that they will make your Case their own; and how careful they are (as they will ever be) of your Indemnity, to preserve you from any present or future Evil that may befall you, for the Execution of their Commands."